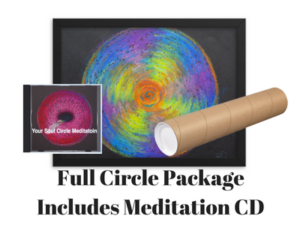 A Custom Meditation CD based on your Circle, curated for you by Scott Schumacher. * 7.5% sales tax will be added for Colorado residents. * $15 standard shipping and insuring costs will be added for US addresses. 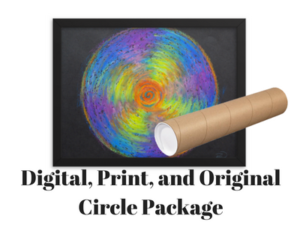 * For International Shipping and those wishing additional matting and/or framing services (or custom larger sizes), customers should first contact Rita directly via email for a Custom Order quote. Each circle brings messages and/or parables with it for your learning and expansion. Rita is a conduit while she draws your circle and then meditates with it. These messages are specific to you and your life and will be emailed to you. 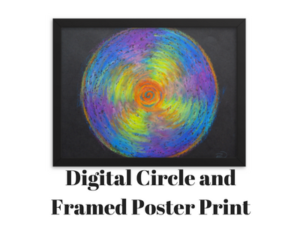 To Contact Rita and inquire about a Custom Order, International Shipping, or additional matting and framing of your Circle; or for general questions; send an email message to Rita@RitaRoberts.com. Your Circle is a One-of-a-Kind, curated meditation tool and art piece, created in collaboration with you. You will be auto-forwarded to a page to schedule a 30-minute phone consultation. After scheduling, you’ll be taken to a pre-consult questionnaire. This is an opportunity to provide some written information about yourself — a brief description of your current life, what your passions are, what you feel is a sticking point at the moment, or the place you’d like to move into within yourself. The goal of the Soul Circle is to guide you, your choices, actions, beliefs and feelings about yourself to being more truthful. In other words, to integrate the you which operates in the world with your soul and all the gifts which are unique to you but might be buried beneath a thin layer or a giant mountain of faulty information. If it’s an outer goal you’re working toward, the Circle still tend to address the inner condition. We have to become the person who would have that external thing or situation — job, money, health, achievement, etc. Once you receive your circle, your part is to dedicate yourself to meditating with it. Use your Soul Circle to start your meditations or for the entire session, whichever feels right to you. I recommend at least 20 minutes twice a day, but one hour sessions are better, even longer still if you feel called to stay in that state. Focus on the Circle, allow any thoughts or feelings to come up, just note what they are, you’ll feel it if it’s significant and coming from a greater knowing. Keep your eyes open for as long as you wish. If your mind wanders while your eyes are closed, use a mental image of your Circle to bring the mind back to a quiet state. Even while you’re not meditating, know that the Circle carries energy with it — you don’t have to attend to every detail, let the Circle do some of the work for you. Choose ease.